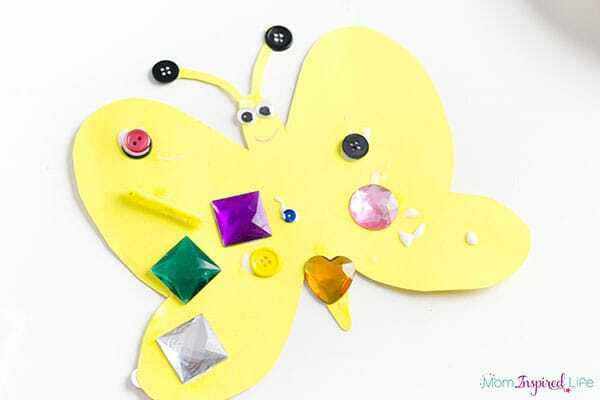 This butterfly collage art activity is definitely a craft you should try this spring! 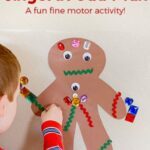 It’s a process art activity develops fine motor skills and creativity. My gingerbread man and snowflake collage art activities have been super popular with all of my readers, so I figured I would keep the fun going with a spring butterfly version. If you want to try another spring version of this collage activity, check out this invitation to decorate an Easter egg collage activity. Butterflies lend themselves perfectly to this kind of activity. Adding sparkly gems and colorful sequins and buttons to butterflies just feels right. My kids would agree and I bet your kids will too. 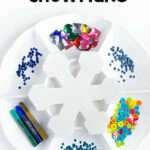 This art activity is super simple to set up. 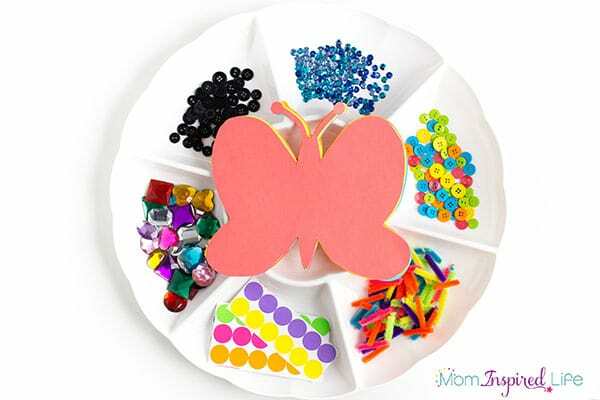 All you need is a bunch of random bits and pieces – buttons, sequins, gems, stickers, even tiny scraps of paper or paper dots from a hole punch. I like to put everything in a divided tray for easy access and to keep everything together for future use. I printed the butterfly templates on colored cardstock so that I wouldn’t need to use colored ink on these. This makes it even easier to do too. Just print and cut them out. Then place them next to the tray full of art supplies. 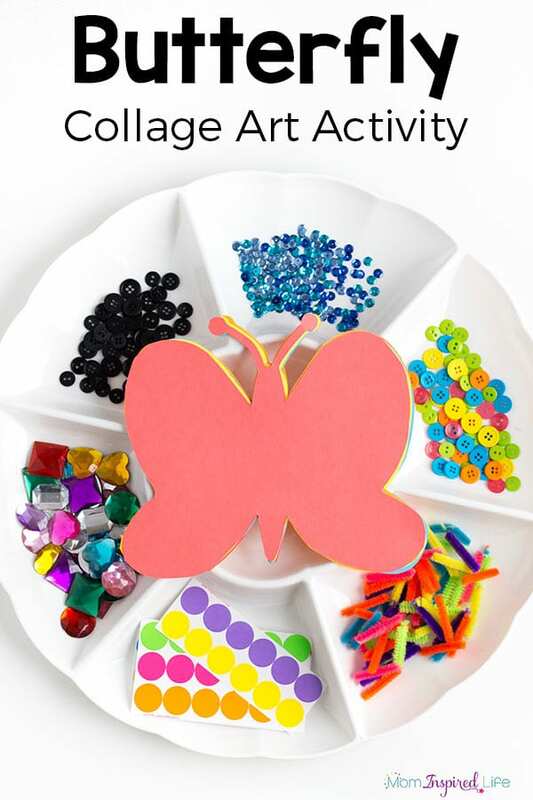 Collage activities are a fantastic way for young children to express their creativity. This art activity is all about the process. So the final product will look different for each child. 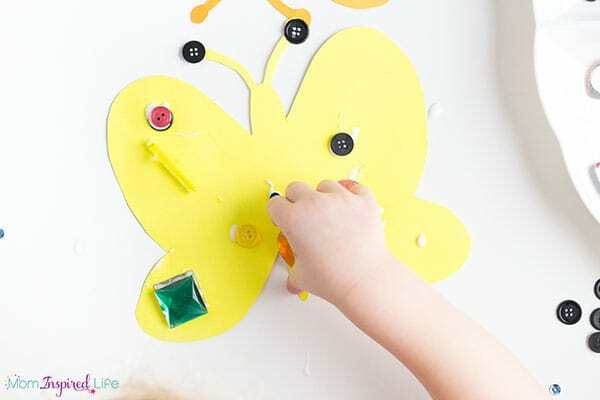 Children are free to use the supplies to decorate the butterfly any way they want. Collage art is also an excellent way for children to develop fine motor skills. Placing small pieces on the butterfly and squeezing the glue bottles really work out those small hand muscles! I also like to leave the supplies out on the table for the kids to go back to over the course of several days. My 3.5 year old loves to go back throughout the day and decorate her butterflies. Sometimes she makes a new one and other times she just adds things to one of the butterflies she has already decorated. 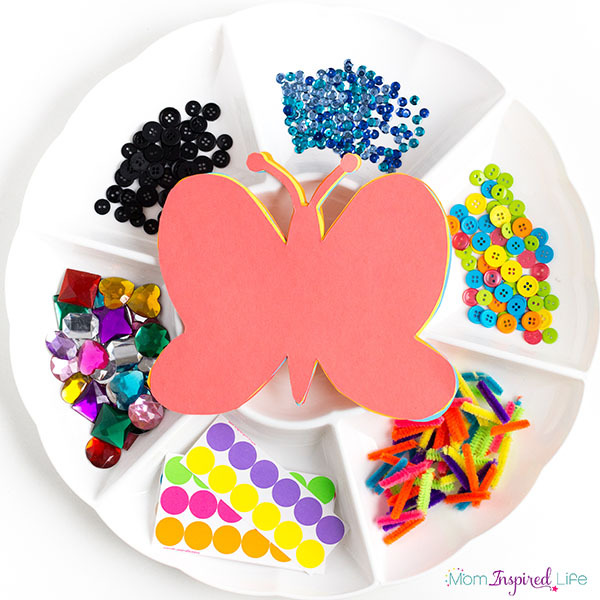 Print the butterflies out on colored cardstock. Place the craft supplies in a divided tray. I cut the pipe cleaners into small pieces first. Make sure you have a glue bottle for each child. 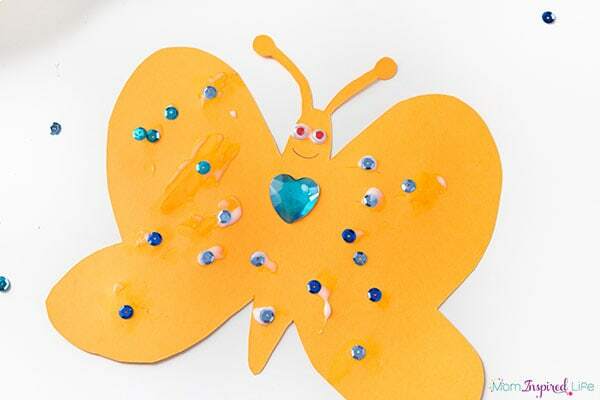 This invitation to decorate a butterfly is so inviting. My kids were totally engaged in it. 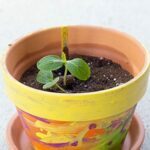 So grab the craft supplies and set up this spring art activity for you kids too. They will love it! 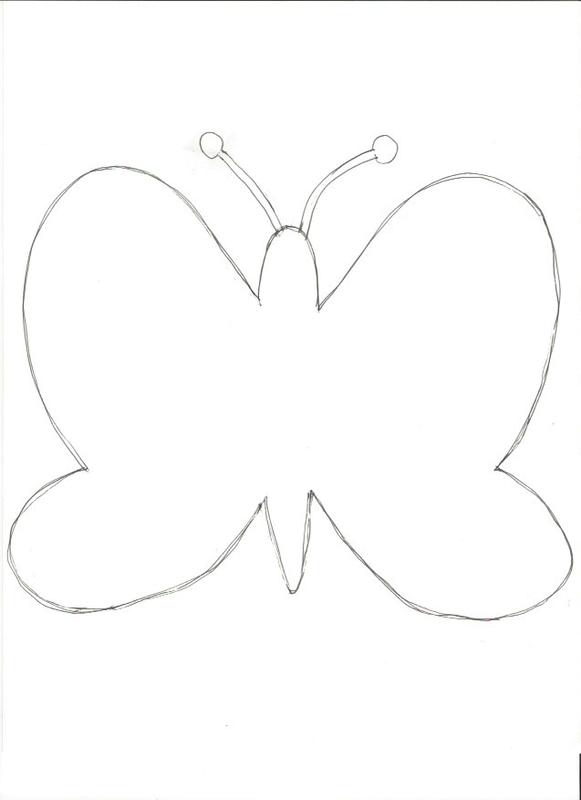 Click the button below to download the butterfly template. It is just a quick sketch I made. I make sure to choose “fit to page” when I print so it prints as large as possible.